It’s been more than five years since Sedgefield Baptist Church first learned that a six-lane roadway might be passing through its sanctuary. That’s when the North Carolina Department of Transportation first approached the church on High Point Road in Greensboro and told its elders about plans to widen the road. The DOT offered $950,000 for the church to move on – fair market value it said, according to its appraisal. The church, which had been there since the 1950s, said no thanks. The DOT moved on to other projects, but last year it returned with an updated appraisal and the news that the church would have to vacate by October 2011. This time the offer was $960,250. The congregation was not impressed. After some debate, its members dug in and got ready for a fight. 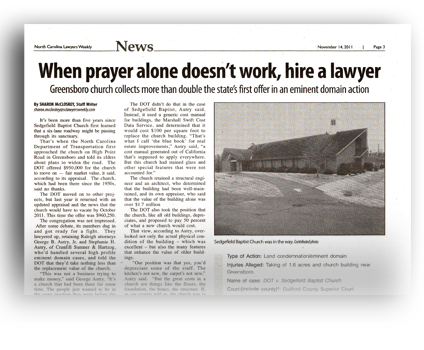 They lawyered up, retaining Raleigh attorneys George B. Autry, Jr. and Stephanie H. Autry, of Cranfill Sumner & Hartzog, who’d handled several high profile eminent domain cases, and told the DOT that they’d take nothing less than the replacement value of the church. By the church’s estimates, the land and buildings were worth more than twice that amount. Valuing a church, it turns out, is not like valuing a house. To the DOT, Sedgefield Baptist Church was just another structure on land it needed to plow through, and assessed it as such. But to its members, its intrinsic value was much more. The church retained a structural engineer and an architect, who determined that the building had been well-maintained, and its own appraiser, who said that the value of the building alone was over $1.7 million. The DOT also took the position that the church, like all old buildings, depreciates, and proposed to pay 50 percent of what a new church would cost. That view, according to Autry, overlooked not only the actual physical condition of the building – which was excellent – but also the many features that enhance the value of older buildings. Shortly before the Oct. 1 deadline, the parties agreed upon a settlement of $2 million and the church members found a new home on Dillon Road. They took their pews and stained glass with them. DOT counsel Hilda Burnett-Baker did not return a call for comment. Injuries Alleged: Taking of 1.6 acres and church building near Greensboro.